"The Wakefield Municipal Light Department not only provides electricity to its customers, but also supplies natural gas to the community. The town of Wakefield purchased the community's electric and gas systems from the Citizens' Gas & Light Company of Reading, South Reading and Stoneham by a vote of its citizens in 1894. After supplying the gas until the mid-1920s, the Wakefield Municipal Light Department began buying its gas from the Malden Gas Copmany in 1924 and later continued purchasing its gas from the company's successor, the Mystic Valley Gas Company. In 1969, gas service to the Montrose section of the town was supplied by a connection obtained from the Lynn Gas Company. Shortly after obtaining this connection, the U.S. Securities and Exchange Commission ordered the New England Electric System to sell its gas systems, two of which were the Lynn Gas Company and Mystic Valley Gas Company. The companies were purchased by Boston Gas Company, the present supplier to the Wakefield MLD. Today the MLD provides gas service to 5000 homes in Wakefield." -- Text from calendar. 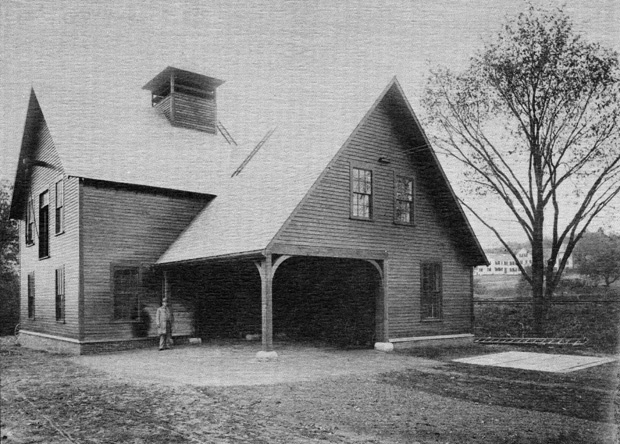 ;Caption: The old Municipal Light Barn, on North Avenue, in 1893, just prior to the town's purchase of the Citizens' Gas & Light Company. Standing in front of the building is Superintendent Wallace. “Gas division,” NOBLE Digital Heritage, accessed April 22, 2019, https://digitalheritage.noblenet.org/noble/items/show/6951.